The days are getting longer, and right on schedule, we’re seeing some restlessness start to appear among this winter’s cohort of owls. 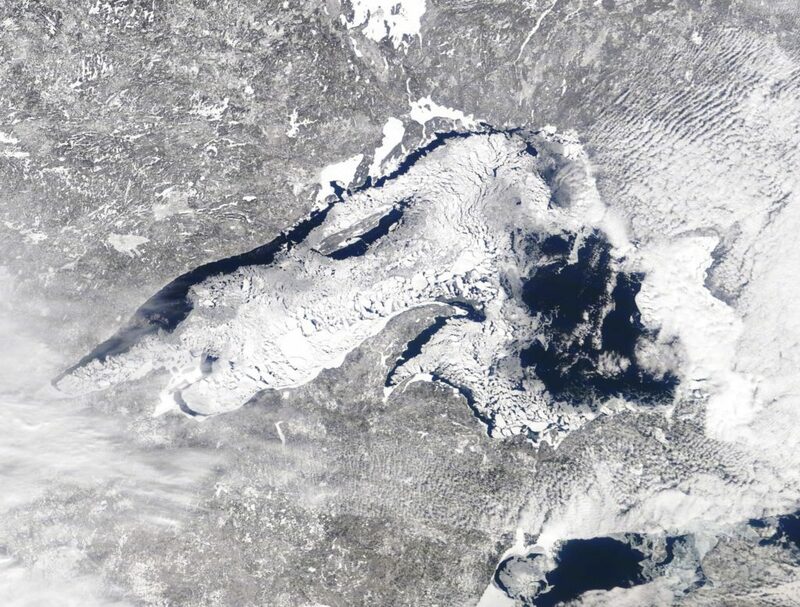 But there’s a lot of ground to cover this week, including the second “bomb cyclone” of the winter on the Northeast coast, an ice-queen owl on the Great Lakes, and a turbine-dodging bird on the prairies. Here are some of the highlights; check individual owls’ maps for the latest updates. Several of our tagged owls that have been highly predictable this winter suddenly got a bit of wanderlust in the past week — likely the effect of warmer temps and longer days. 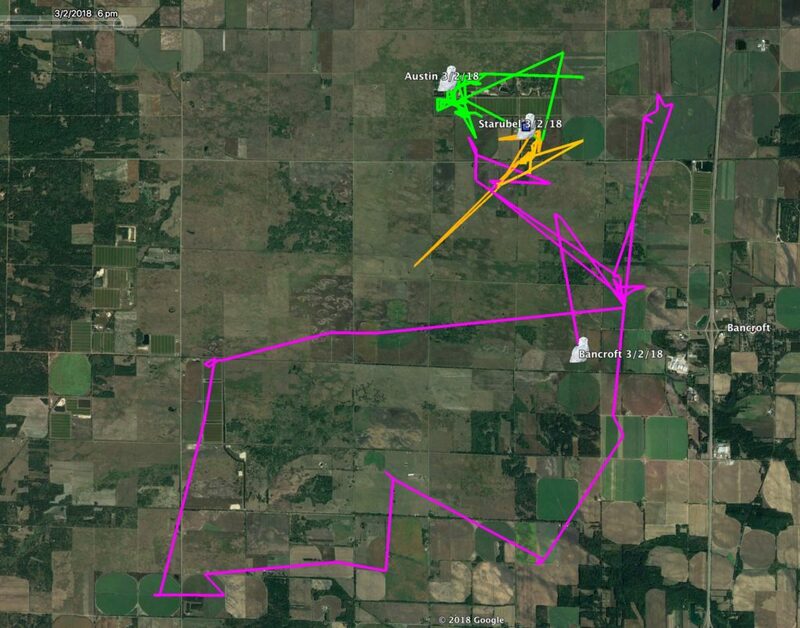 In North Dakota, Ashtabula moved about 27 miles (43 km) north Feb. 13, and for the next two weeks spent much of his time flying below and among the 113 turbines of the Luverne Wind Farm, which straddles the Griggs and Steele county line. Although Ashtabula generally appeared to be avoiding the immediate vicinity of the 260-foot-tall turbines, we breathed a little easier when he moved farther north, out of the wind farm, the night of March 1-2. Arlington, in Wisconsin, also took off on an unexpected flight, looping 117 miles (188 km) to north between Feb. 27 and March 1, the heading back to his winter territory north of Madison. He made a shorter exploratory flight a few weeks ago, too, so the season may be working its magic on him. Elsewhere in the Badger State, it may have been competition rather than spring that prompted Bancroft to fly up to 6 miles (10 km) from his winter territory, now that Straubel appears to be staking out part of it. Straubel, you’ll recall, is a big female that was relocated from the Green Bay airport, and it looks like she’s bumping Bancroft. Austin, another small male, is hanging tight to his spot on part of a commercial cranberry bog that Straubel is also using. 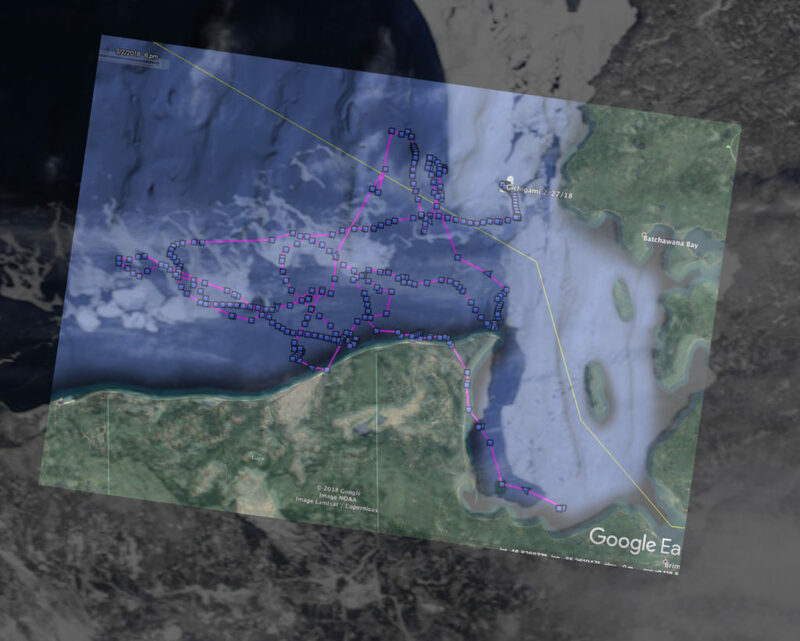 When we tagged Gichigami along the frozen shore of Lake Superior, we expected there might be long gaps when she was out of cell range on the lake, and that’s been the case. 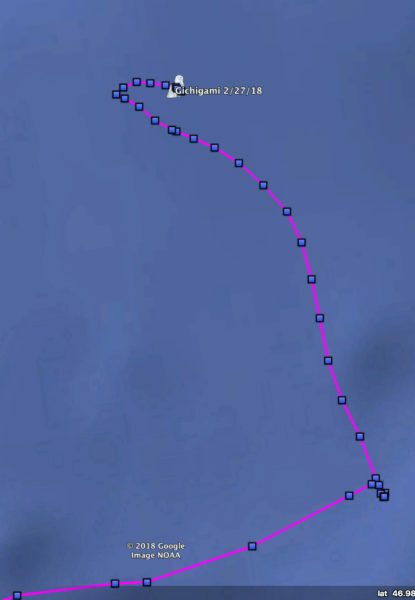 But this past week she checked in for the first time in a while, and uploaded a very cool, meandering track up to 23 miles (37 km) from shore. In all, she moved 313 miles (504 km) during the two weeks she was out of touch via cell modem. 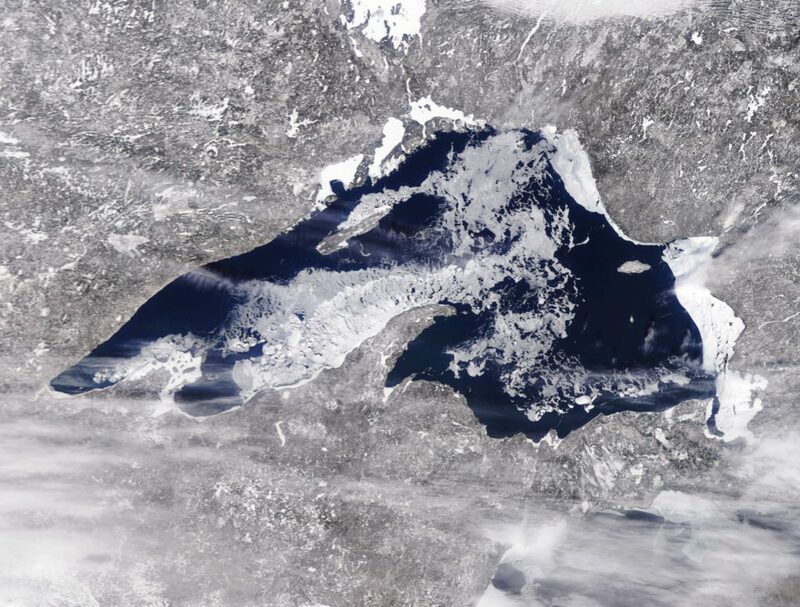 Ice conditions on Lake Superior have changed dramatically in recent weeks, with a sharp decrease in ice on the eastern end of the lake almost from one day to the next, as temperatures and prevailing winds changed. But by overlaying NOAA CoastWatch satellite images with her track, we get a sense of how Gichigami has been riding on ice plates and floes, pushed by the wind — the very steady, even pace of the hourly position fixes on Feb. 27 show her ice raft was being nudged by the wind at about a third of a mile (0.5 km) per hour, then dropping to a third that pace by evening as the winds shifted and died. 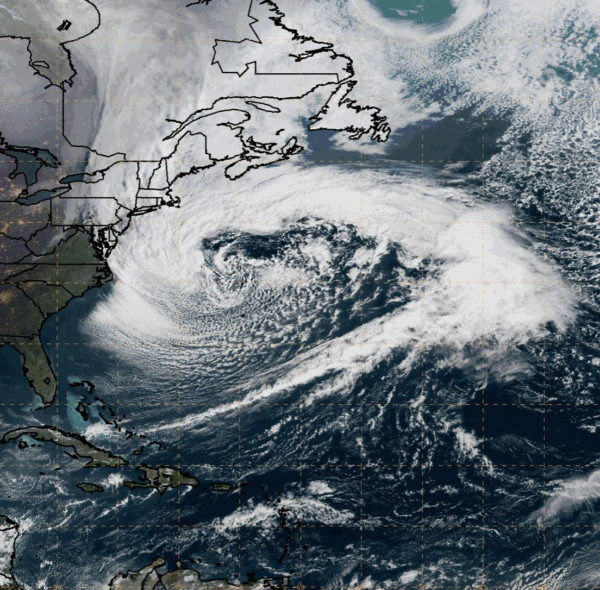 We’re also keeping a close eye on the six owls we have along the mid-Atlantic and Northeast coast, because for the second time this winter a huge nor’easter exhibiting what meteorologists call “explosive cyclogensis” has pasted the area from New Jersey to Maine. Peak wind gusts of 71 mph (114 kph) were recorded on Block Island, where just after dark on Friday Manisses appeared to be hunkered down a few hundred yards inland from Great Salt Pond. In the Blue Hills Reserve outside of Boston, Norman Smith reported a gust of 93 mph (150 kph), and he was concerned about Logan and the other snowies on the coast (though the tree that crashed through his daughter’s house was a more pressing worry). Logan appears to have ridden out the early stages of the storm near the Necco Candy factory and high school in Revere, just north of Boston, a town that had already been hit with heavy coastal flooding earlier in the day. We won’t get new position fixes on the birds until Sunday or Monday, so we’ll have to keep our fingers crossed, but Norman noted that Logan– unlike the other coastal owls we’re tracking this winter — is an experienced adult, which may help keep her out of trouble. 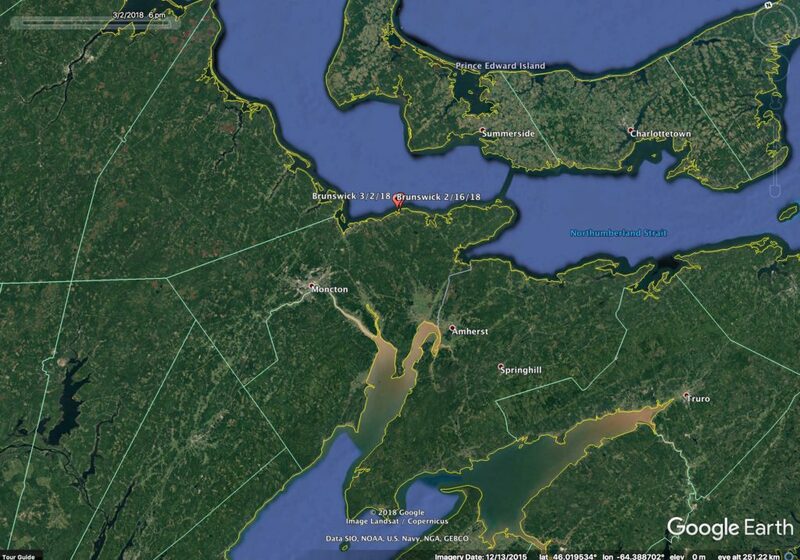 Hardscrabble, Chickatawbut and Wells remain where they’ve been all winter in Ontario and Quebec — and Hardscrabble rebuffed a fresh attempt this week by our colleague Dave Okines to trap him and replace his transmitter. We got another brief check-in from Brunswick, up on the coast of New Brunswick at Cap-Pelé — none of her last two years’ worth of data has come through yet, but her transmitter is gaining voltage nicely and we’re hopeful we’ll start getting it before too long. Snowy owl with tag 25 has been at the Estes terminal all week in Wyoming Mi. We have lots of pics and you can get 20 ft from him and doesn’t seem to care. He flies just fine. Wing-tagged owls like this are not part of Project SNOWstorm. Those with white wing tags are part of a study conducted by USDA Wildlife Services, involving owls being relocated from airports. Those with green or other colored tags are part of separate studies. Please report any wing-tagged snowies (with location, tag number and color) to the U.S. Bird Banding Lab at https://www.pwrc.usgs.gov/BBL/bblretrv/. Somehow i am no longer receiving the updates. Last one was late February. Can i get them again please?